The second leg of the tour, kicking off in September, will include stops in New York, Los Angeles, Chicago and Boston. Disney Junior Dance Party on Tour will be dancing for a while longer. The tour — featuring a slew of Disney Junior characters, from Mickey Mouse to Sofia the First — has added 50 more shows starting in September. The second leg of the tour will include stops in New York, Los Angeles, Chicago and Boston. The additional dates come as most of the initial 65 stops are sold out and second shows are being added in multiple markets. Red Light Management's Jonathan Shank, who produces the show, said the demand for tickets has been "absolutely incredible" and credits the interactive elements of the show and the audience engagement as just two of the reasons for its success. "What I love about the show is that it provides families with the kind of experience where they can come together and have their first concert or theater experience," Shank said. "Hopefully, they walk away from the show with a core memory of connecting with their favorite characters from Disney Junior and having this unique experience together." 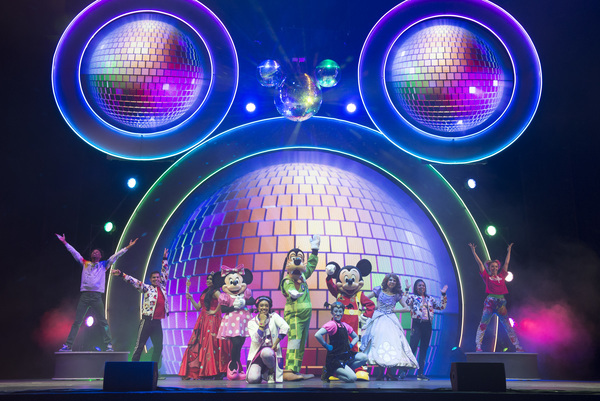 Disney Junior Dance Party on Tour is described as a "high-energy interactive tour" that also is an "immersive live concert experience designed for kids and families." The 90-minute concert features live appearances by characters from Disney Junior series, including Mickey Mouse, Minnie Mouse, Goofy, Elena of Avalor, Sofia the First, Doc McStuffins, along with interactive onscreen moments with Puppy Dog Pals, The Lion Guard and Muppet Babies, as well as what's being billed as the first-ever live appearance by Vampirina. Disney Junior Dance Party on Tour features 20 songs from Disney Junior's hit series, as well as two new original songs for the tour. The show also features state-of-the-art LED technology, a giant Mickey Mouse-shaped DJ booth, high-tech scrim screens that transport characters into the theater and 4D special effects. "I knew the response was going to be positive, and that combined with first-class production and the incredible marketing efforts that Disney provided have really allowed for this tour to have a great platform," Shank said. "It's really the first time that people can come to see all their favorite Disney Junior characters, including the Puppy Dog Pals and Vampirina. When Vampirina appears, she gets one of the loudest cheers of the show." Shank said that he envisions the tour running for a long time, with the show likely getting a "refresh as there is more content to incorporate" and new characters are introduced. The tour, directed by Amy Tinkham (ABC's Dancing With the Stars) and repped by CAA, also includes a 15-minute interactive preshow countdown featuring new original song "I'm a Big Kid," written by Beau Black (Mickey and the Roadster Racers, The Lion Guard). The exclusive presale for the new dates begins Monday, with the general public on-sale starting Friday, April 27. For a complete list of on-sale cities and upcoming shows, visit disneyjuniortour.com. A VIP package also offers kids and families the chance to meet some of the characters in person.